MY NEW BOOK PICKLEWITCH AND JACK IS OUT NOW!!! Earlier this year I was let into a secret; I’d been nominated for the prestigious Ruth Rendell Award, to be presented to the author who has done the most to champion literacy. I didn’t win, but I was over the moon to have been considered. I’d like to say a HUGE thank you to Devon librarians, to Libraries Unlimited and to Chief Exec Ciara Eastell OBE for nominating me – it’s such an honour and I was very touched. FOR THE SAINSBURY’S CHILDREN’S BOOK AWARD 2017! I am over the moon to be able to announce that Knitbone has been selected as one of three in the fiction category. Read more here I’m particularly pleased because it’s in partnership with Booktrust who are all about ‘recognising the power of reading to transform a child’s life’. May 2017 – KNITBONE PEPPER WINS THE BOOK FACTOR 2017!! Knitbone Pepper won the Simply Books Book Factor award for 2017!!!!! Voted for exclusively by children the awards ceremony was held in Stockport Plaza, a big theatre. When I arrived it was full of children and the atmosphere was amazing. Thanks so much to everyone who voted for Knitbone and to Simply Books for organising the awards. I am truly over the moon. 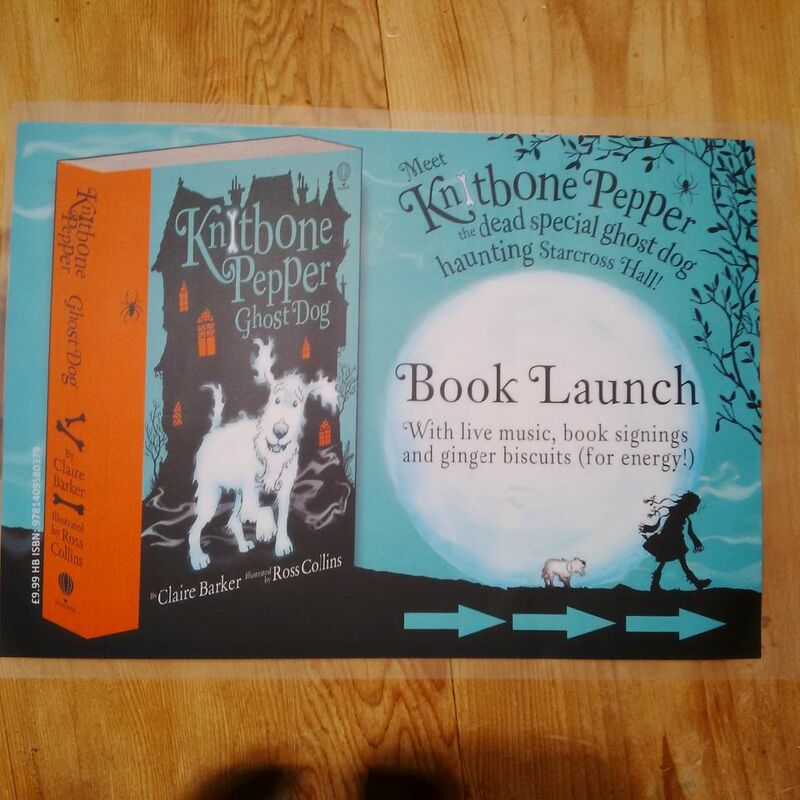 *Competition time* head over to Twitter, Facebook or Instagram ( links on my contact page) to be in with a chance of winning a signed dedicated copy of the new Knitbone Pepper paperback! My lovely German publishers, Kosmos, serialised the first few chapters of Knitbone in Schwarzwälder Bote, a regional newspaper covering the Black Forest area. Imagine that: a story every day over seven days in the newspaper for children. Germany, I ❤️ you. I am absolutely thrilled that Knitbone has been shortlisted for the Book Factor 2017 awards organised by the fabulous Simply Books of Bramhall, Cheshire. I had such a brilliant time visiting schools with them last autumn so this news is the icing on the cake. Two thousand children will be voting and I’m up against some great authors, so fingers crossed! Came home from holiday to find the new paperback in my postbox. It’s beautiful, so shiny and glossy! I love the little copper leaves. Out very soon…. A mad and crazy day in which I visited about 900 Barnstaple children, over seven stops. It was SO enjoyable though. Here are some pictures. 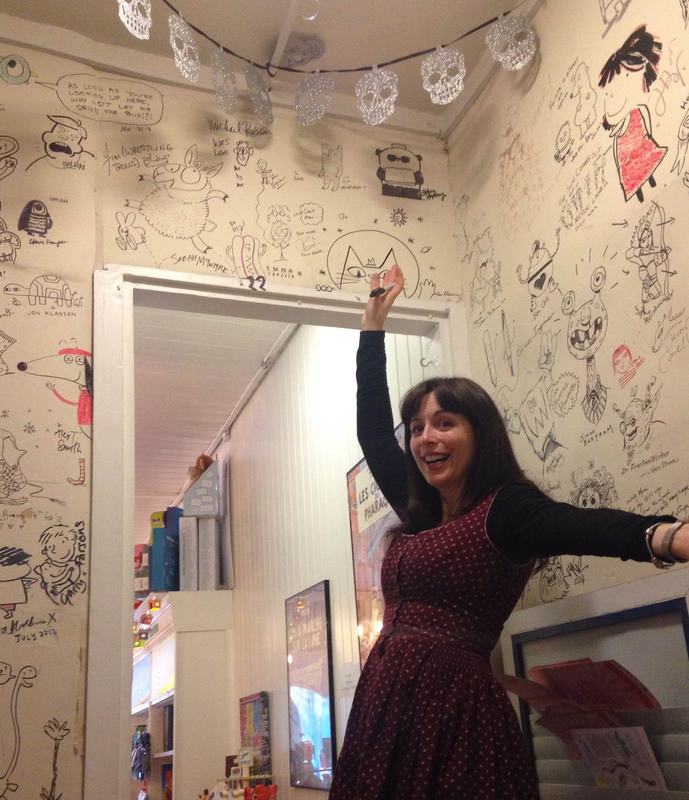 The Edinburgh Book Festival was so much fun! Ross and I had a wonderful time and met some familiar faces. 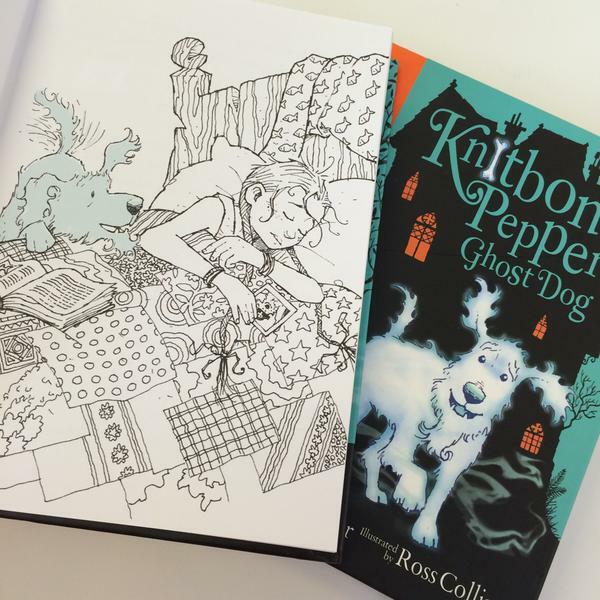 Early copies of Knitbone Pepper and a Horse Called Moon were on sale in the bookshop and Ross gave away his beautiful drawings. Scrolls ready for my Revolting Writes workshops to be held at Barnstaple (tomorrow) and South Molton libraries (Friday) as part of the Big Friendly Read Summer Reading Challenge. Can’t wait. TODAY WAS THE LAUNCH OF THE SUMMER READING CHALLENGE! 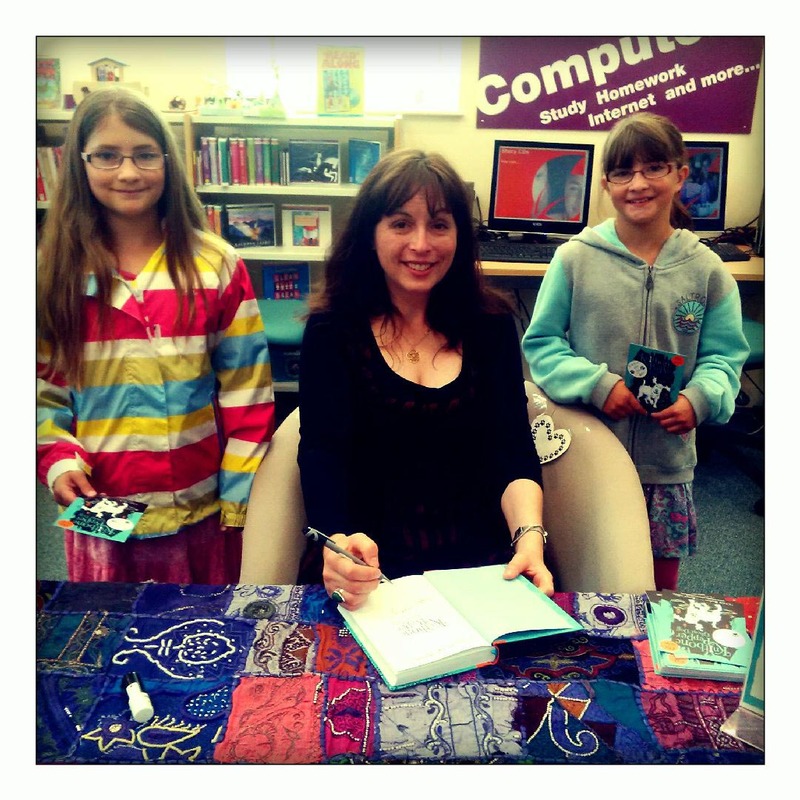 Here I am meeting some young readers and writers at Barnstaple Library, talking about the Revolting Writes competition. I had a lovely day and can’t wait to see your awful, horrible, dreadful, revolting rhymes! Thank you to the staff and children of both schools who made me feel so welcome. I shall remember my day for a long time. 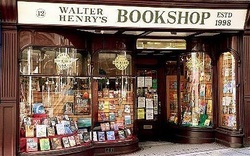 In the afternoon I was invited to Walter Henry’s Bookshop in Bideford to celebrate the anniversary of Shakespeare’s death. There were lots of friendly writers there and I learnt some very interesting historical facts about laces! This evening me and my author friends; Victoria Eveleigh and CJ Busby, were all invited to speak in Bideford College library as part of the World Book Night celebrations. 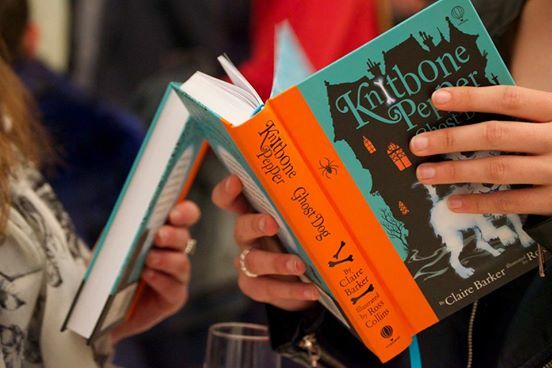 Victoria talked ponies, Cecilia talked swords and I spoke about Knitbone. I met so many wonderful children and had a really great time together. WOW! What a day! First of all I visited Oldfield Park Junior school in Bath where all the children dressed up in marvellous hats just like the Peppers! Thank you so much for being so welcoming and having such excellent questions. I hope you all enjoy your books! Knitbone is in today’s Sunday Express! Sam and I went over to the centre and met her. They played for a while in the introduction room and, despite Luna barking in his ear for quite a long time, he really seemed to like her! And not only this, our whole family ADORED her: she is the sweetest little soul who yowls like a little cat when she is sad and sort of purrs when she’s happy. All of this is remarkable when you realise that Luna had a such a terrible start in life. Caged for 15 hours a day, she had dreadful separation anxiety. She kept being sick, her fur was sparse in places and her ribs stuck out. She hated going outside and had to eat special prescription food five times a day, as well as take two different types of medication.The situation was so bad that she came on a full foster plan, which means her vet bills are covered for life. The centre had done their very best with her but they knew that what she really needed was a special someone. She eats all sorts these days ( cheese and chicken are her favourite treats at the moment) and is never sick any more and the tablets are history. She’s putting on weight and her coat is glossy and full. She can even be left at home alone for up to 4 hours at a time quite happily. Best of all she doesn’t run away from her lead and loves the outdoors. She’s cheeky, funny, very loving and such a wonderful new addition to our family. It’s been a real joy watching her learn how to love being a dog again. The Dogs Trust didn’t give up on little Luna and or me. And thank goodness for that. Two very happy readers. Hope you are enjoying your books Kira and Silas! 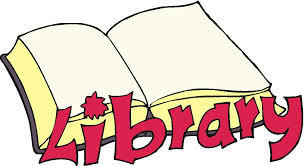 South Molton Library you are the BEST – tea, macaroons, lego club, big pile of books all sold out in the first 20 minutes and best of all, loads and loads of smiling faces. 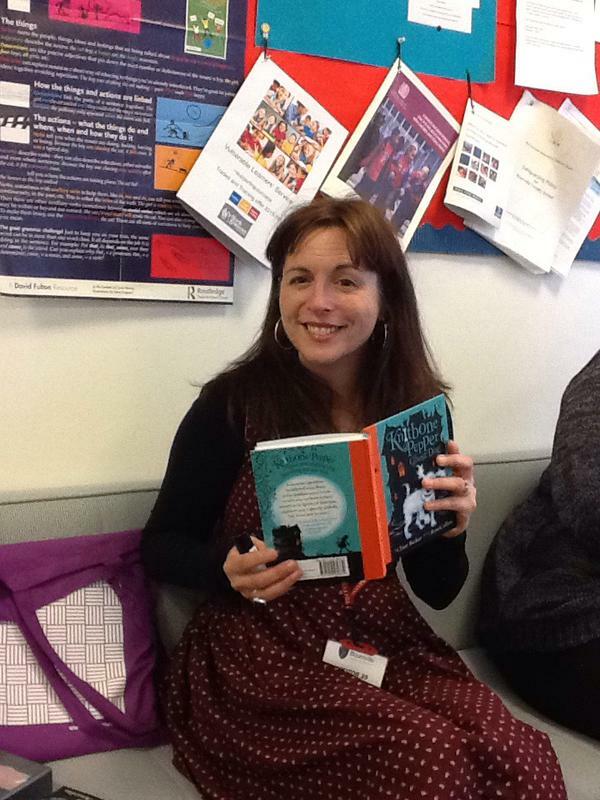 Then North Somerset Childrens’ Book Group published this interview with me on their blog, which is rather thrilling. The questions were very interesting and perceptive, so I particularly enjoyed answering them….. Such a lovely review by Charlotte Heathcote in The Daily Express today. Back on home ground. Looking forward to visiting North Molton, South Molton, Chittlehampton and Filleigh schools on Thursday and Friday this week with my lovely librarian friend Annie, talking about Knitbone and Easter holiday reading. 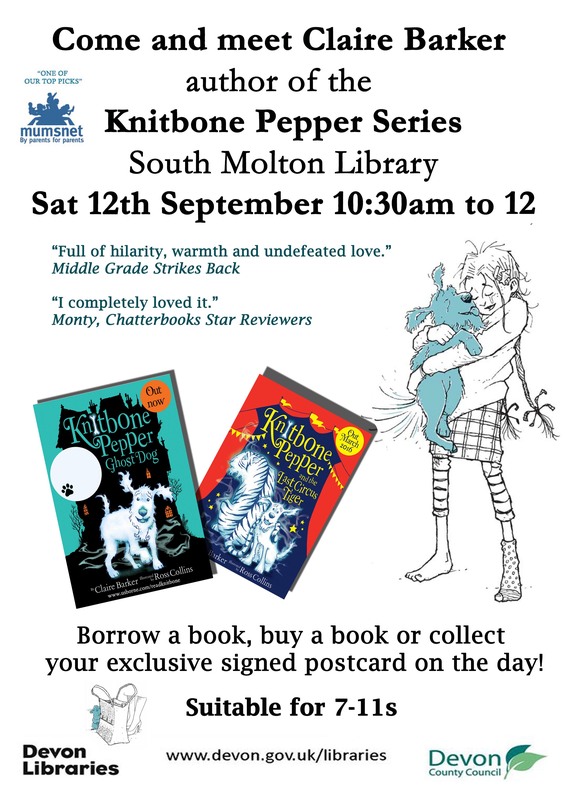 Then, on Saturday morning between 10 and 12 I will be in South Molton Library signing copies of my latest book, Knitbone Pepper and the Last Circus Tiger. You can buy a book on the day (£9.99 provided by Waterstones) but there are only 30 copies, so you’ll need to be quick! Today I visited Broadclyst Primary school, in a really lovely sparkling new hall with amazing facilities, but best of all the children -years 3,4,5 and 6 – were buzzing! We had such a great morning and I signed lots and lots of book plates. and the second was at Sandford primary. In both schools the children and staff were an absolute delight- I met so many interesting people. It was a wonderful way to spend World Book Day. THEN best of all I received these pictures of Ruby’s school project. 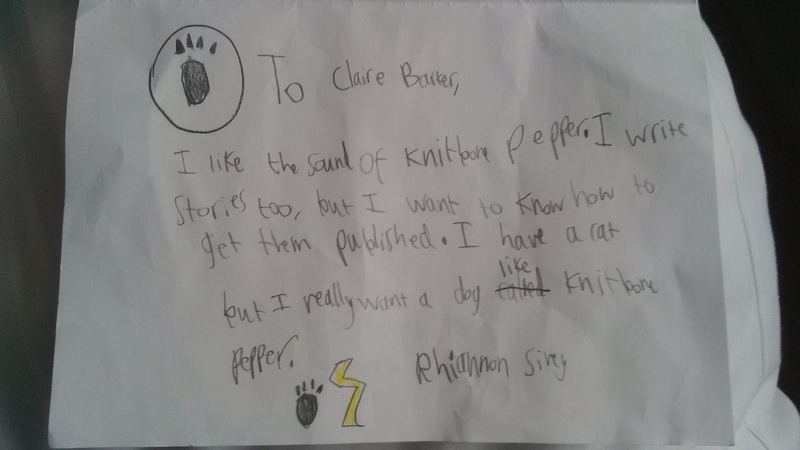 Ruby’s mum tells me that she loves Knitbone and her reading is coming on in leaps and bounds. Aren’t they brilliant? Well done Ruby ( and well done to Ruby’s cat for the photobomb). Today was my book birthday. 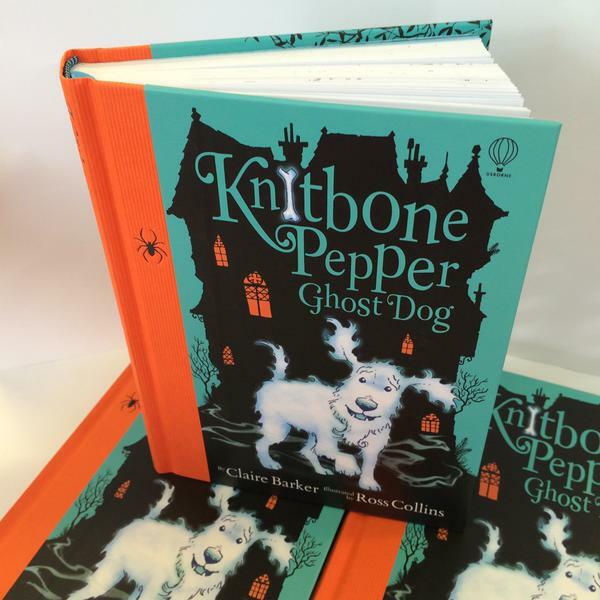 🎂 Knitbone Pepper Ghost Dog and the Last Circus Tiger is out officially today. 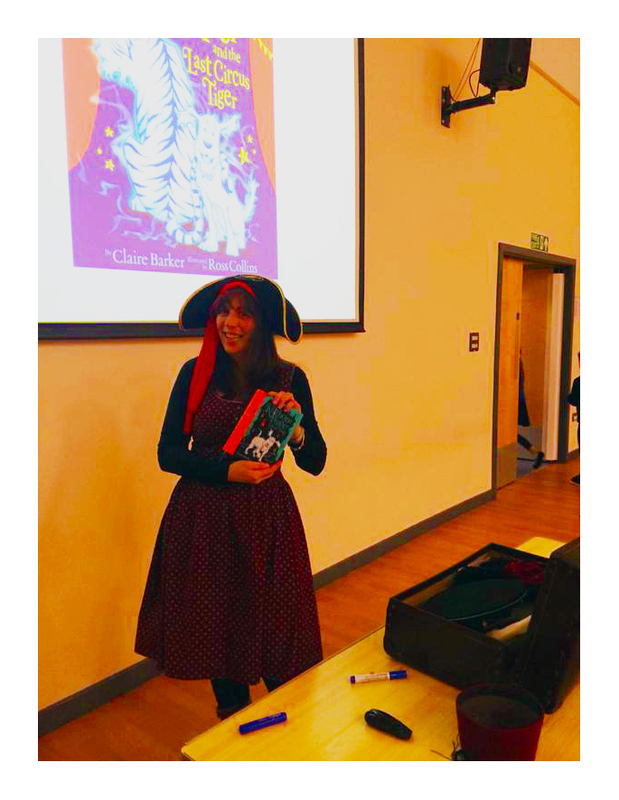 In celebration I visited two schools (super Sidcot and marvellous Mead Vale) and had a BRILLIANT time and signed lots and lots of books, not to mention receiving some beautiful circus themed cakes, stories, cards and letters. On top of this I received two wonderful photos of World Book day costumes; Katie in Edinburgh as Knitbone and Emma as Winnie Pepper. I think they both look really wonderful. WHAT A DAY! Today I’m at Guardian Children’s Books online talking about Dogger, a simply brilliant book by Shirley Hughes, and how it influenced my writing. 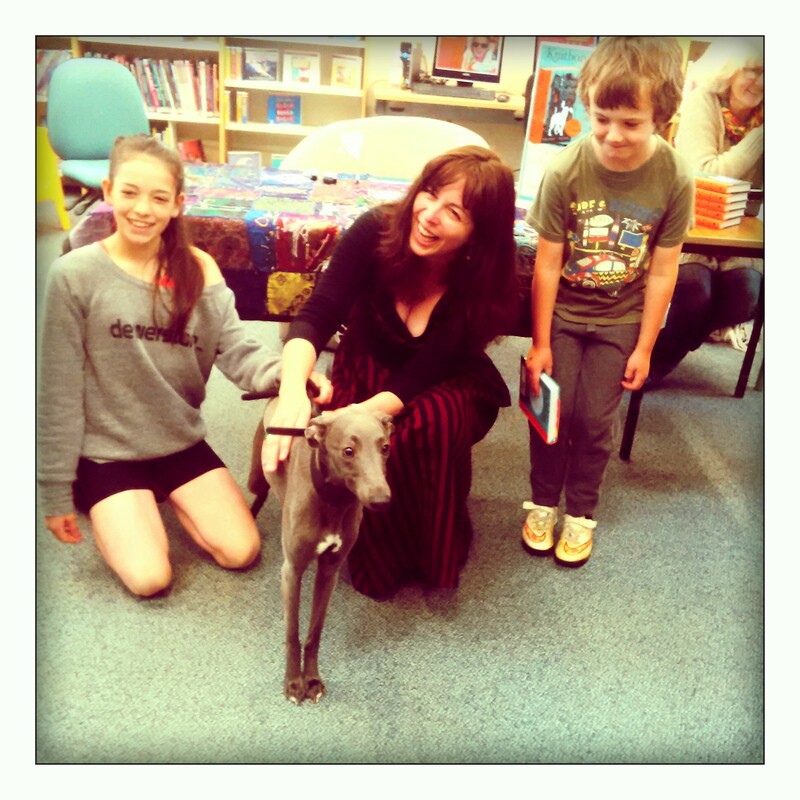 Last Friday I visited Crediton Library Children’s Book Group. Beth the Librarian put on snacks ( biscuits of course) and juice and we all sat down to have a good chat about Knitbone Pepper. I really enjoyed myself and I’d love to go back. 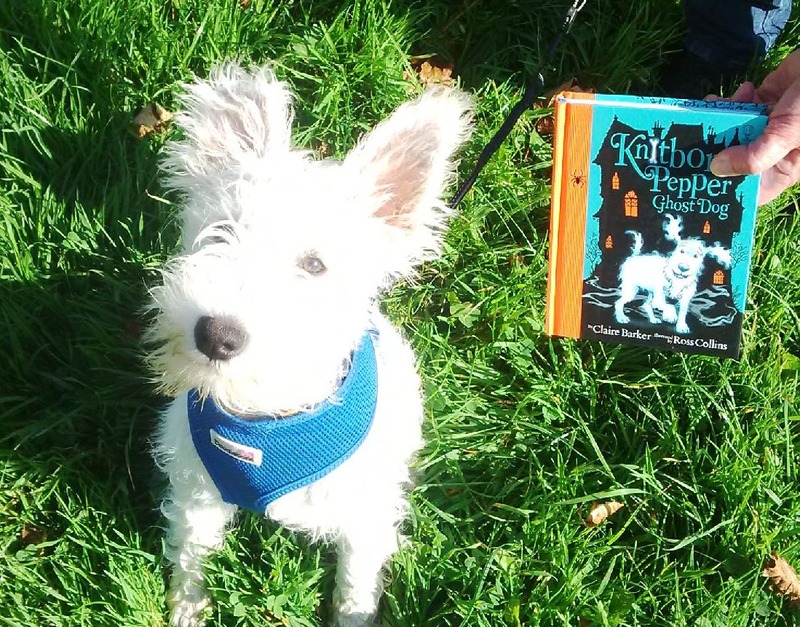 Do you have a book group reading Knitbone Pepper? Would you like me to visit ? Or, if far, far away, even Skype you? If so drop me a line on my contact page and we’ll see what we can do…. 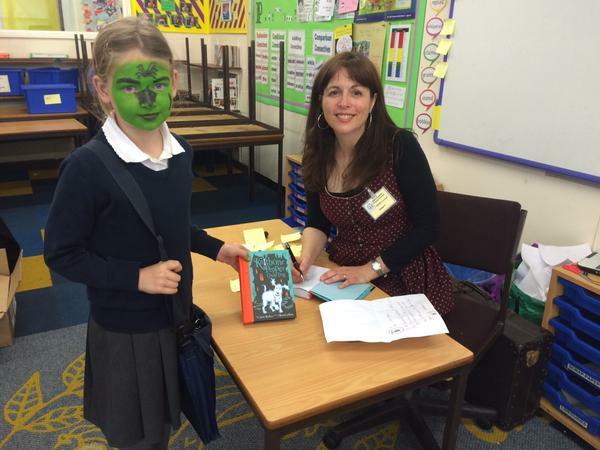 Today I visited Beaford school with fellow author friends CJ Busby and Victoria Eveleigh. We all live in Devon and write about animals so there was no shortage of things to talk about. We had LOTS of fun and the children even gave us flowers at the end. Thanks Beaford school! 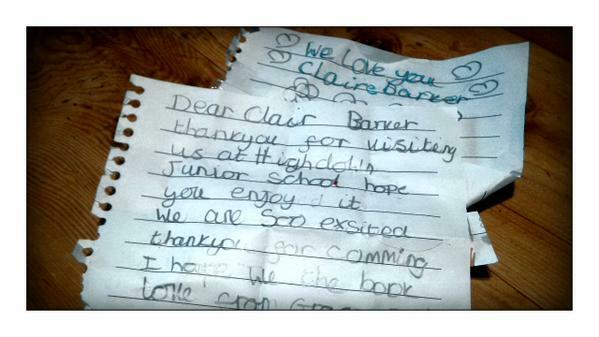 Yesterday I was made very welcome at the Clinton Primary school. I met loads of their pupils, but also others too from Dolton and Monkleigh primary. I had such a fun time and the children were FIZZING with good ideas. I was supposed to visit before Christmas, but I’d had to cancel because I lost my voice and (as anyone will tell you) I talk a lot. As a reward for being patient…shhhh…. 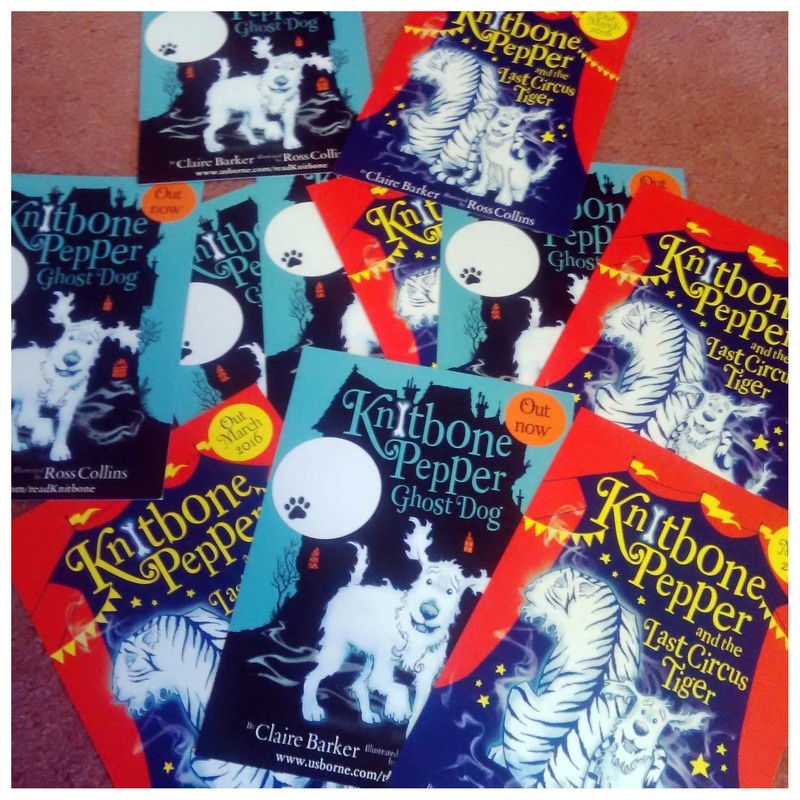 I gave them a sneak peak at the next book in the Knitbone series, Knitbone Pepper and the Last Circus Tiger, even though it’s not due out until the 1st of March. 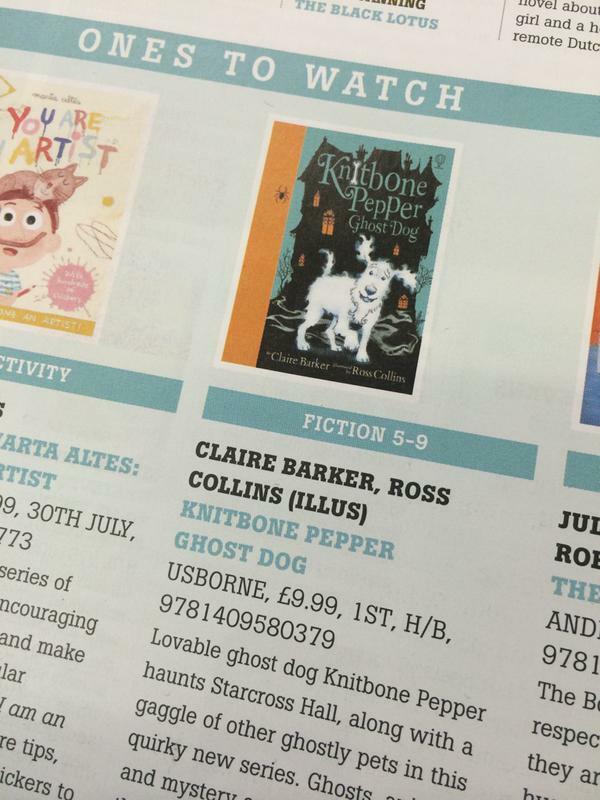 Ross, the lovely folk at Usborne and I are very proud of it and think it is beautiful. I hope you agree. a new ‘person’ has moved in. I can’t say more about this just yet because she is settling, but as soon as she does I’ll tell you more. I am writing a brand new story, hunkered down in my kitchen, surrounded by half drunk cups of tea. I’ve disappeared down the rabbit hole but I’m going to pop up again very soon! Today is the last day of a very busy, very wonderful year. I can’t think of a better way to round it off than by announcing that today Knitbone Pepper is to be published in Spanish. Feliz año nuevo! Come and see me tomorrow! I’m very proud that Knitbone Pepper has been chosen by the BOOKS ARE MY BAG team to be in the new Christmas catalogue. Hello booksellers everywhere – thank you for all that you do. Today with Cathie from the Crediton Community Bookshop I visited, Burrington school, Chulmleigh, Lapford and East Worlington! 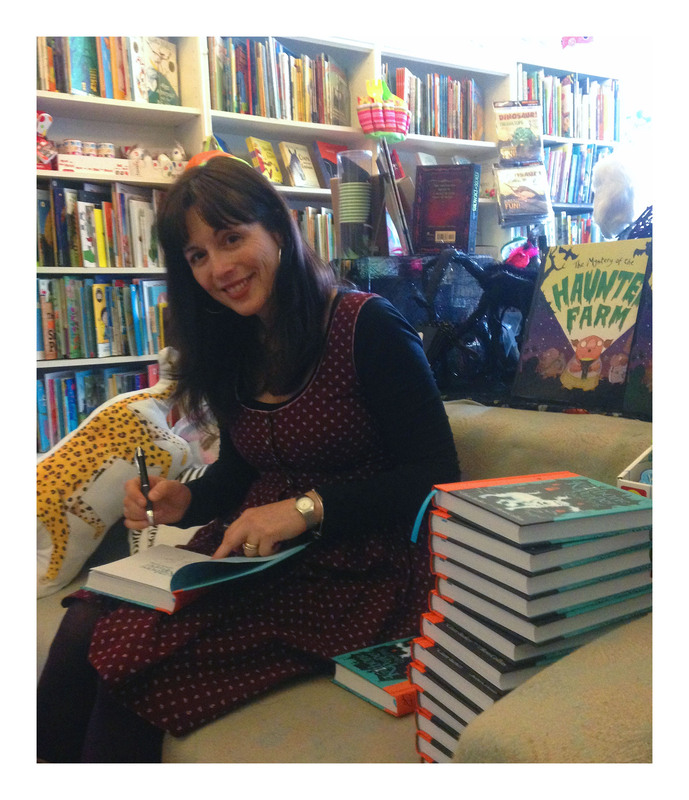 Lots and lots of books were bought and I signed them to lots of special people. Chulmleigh you were particularly OUTSTANDING! In fact there were so many that we sold out of books. Cathie will be delivering the extra copies on Friday to four very patient children. Today I have been very busy visiting three schools – East Worlington, Lapford and Chumleigh in North Devon, not far from my house. They were all really wonderful and in one I even met an old friend (hello Eartha!) 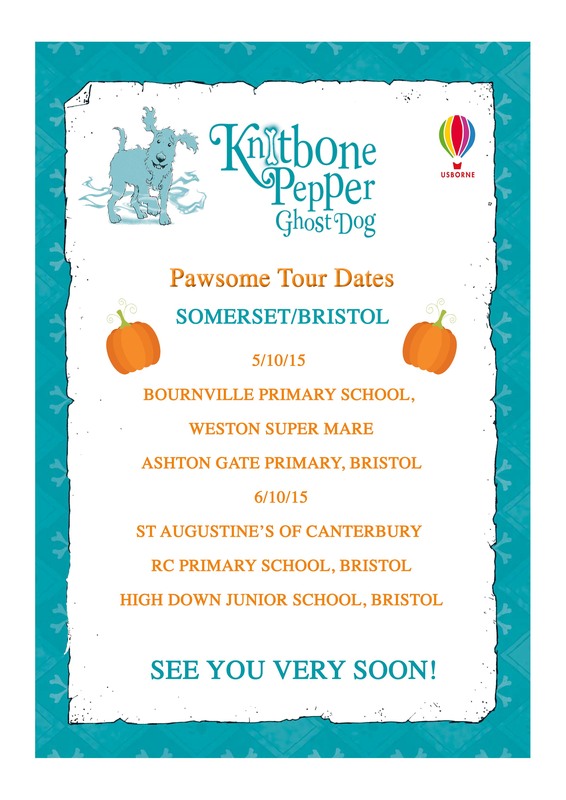 Tomorrow I’m going back again to sign lots of books but first I’ll be popping into Burrington school to tell them all about Knitbone Pepper…. Knitbone Pepper is in today’s papers! Featured in the 5-8 years section as one of the ‘Best books for young minds’ in Metro today. I’m next to Judith Kerr, which is SUPER exciting. In the morning I visited Tregolls school where the children were wonderful, had excellent questions and plans to create their own Beloveds in class. Then I visited Truro library where I found out that there are lots of copies of Knitbone Pepper, but all of them are out on loan, except for one in St Ives, so if you’re there nip down to your library sharpish and nab the only copy. Then I went into Truro Waterstones and signed lots of copies but by now it was raining and I definitely needed a snack. So I visited a local cafe where I met a man with two tiny Chihuahua’s in a bag! They are called Coco and Paris. No chance of them having to get their paws wet, lucky things. Then I went on to visit Bosvigo School. I REALLY loved this visit and met some extremely nice children and teachers. They were all dressed in costumes as a way of raising money for charity. I signed lots and lots of books, was given a special green pen which I will now use for signing, and a little girl gave me this MOST EXCELLENT picture of Krispin O’Mystery with Winnie peeking around the corner. I think it’s amazing. Callington Primary, you deserve a special mention as you were OUTSTANDING! Later on I visited Falmouth and met this rather beautiful French Bulldog puppy called Bee!!! Thank you SO MUCH for making me so welcome! Remember: if you want to come and see me again I’ll be at CREDITON COMMUNITY BOOKSHOP ON SATURDAY 12TH DECEMBER FROM 10:30AM UNTIL 12:30! 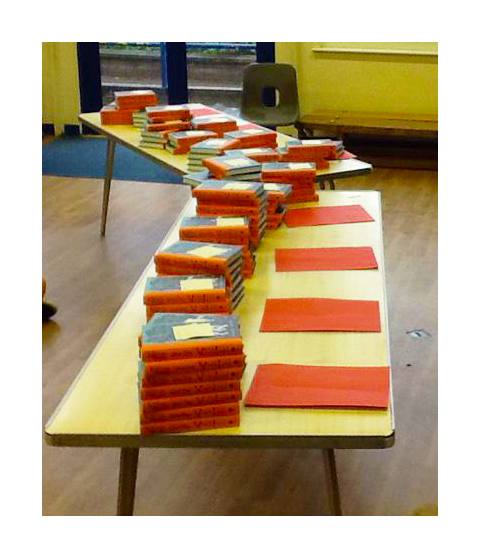 Today I whizzed between Yeoford and Bickleigh Primary schools and lots of smiles were smiled and lots of books were signed. Ooo I DO love this job! Terrific day with the children of Tedburn and Copplestone school today. So many big smiles! 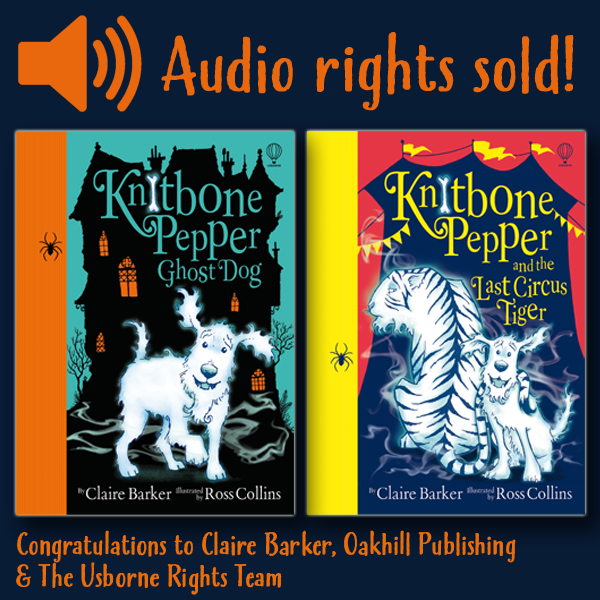 The icing on the cake was coming home to find out that Knitbone Pepper is available as an audiobook here . Have a listen – Knitbone’s got a Bartonshire accent. It made me laugh! I had a great afternoon with the children of Thorverton School today. 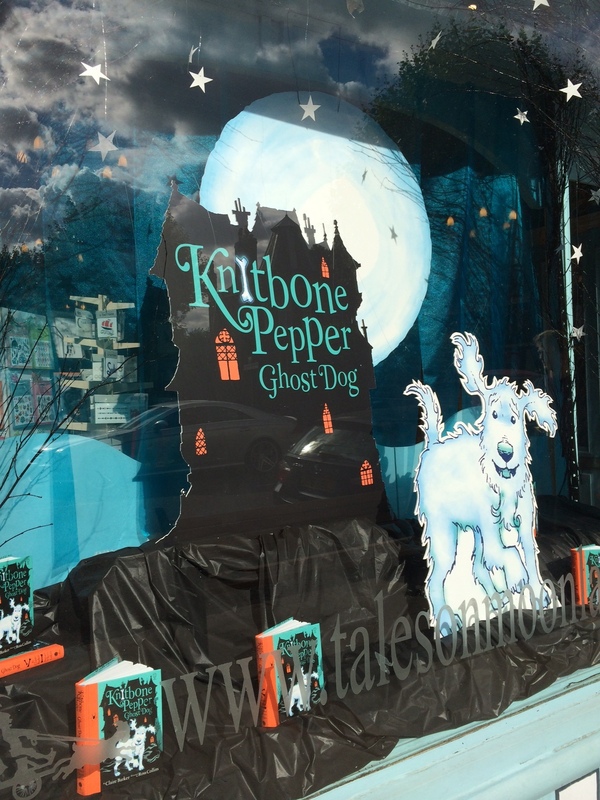 I know lots of you wanted to buy a copy of Knitbone Pepper but had forgotten your money. Don’t worry – all is not lost! Remember you can buy them at a special rate at the Crediton Community Bookshop and I’ll be there on the morning of Saturday the 12th of December signing and saying a Christmassey hello! Come and say hi! Unlucky for some but not for me! I had a great morning at Kingsley School in Bideford and was asked some particularly interesting questions about the Beloveds. Tomorrow I’ll be back, signing books and sitting in for Santa, storytelling. But which book should I read first???? My visit to The Maynard School was as wonderful as always. I learnt lots of useful and interesting things about Cat’s Tongue biscuits, white hedgehogs, and tarantulas! Elisa made me a beautiful, thoughtful book which I will keep always. We talked about our pets and discovered that between us we have enough for a zoo! 14th November – Kingsley School, Bideford. Christmas Craft fair. 11:30 reading. Today I’m going to be at Exeter central library at 11am-12, talking about my animals, Knitbone Pepper and bringing along my suitcase full of things. It’s a free event and little witches, wizards, ghosts and ghouls are most welcome so plunder those dressing up boxes! I’ll be giving away postcards for interesting questions and signing books. See you later! I’m in the newspaper! 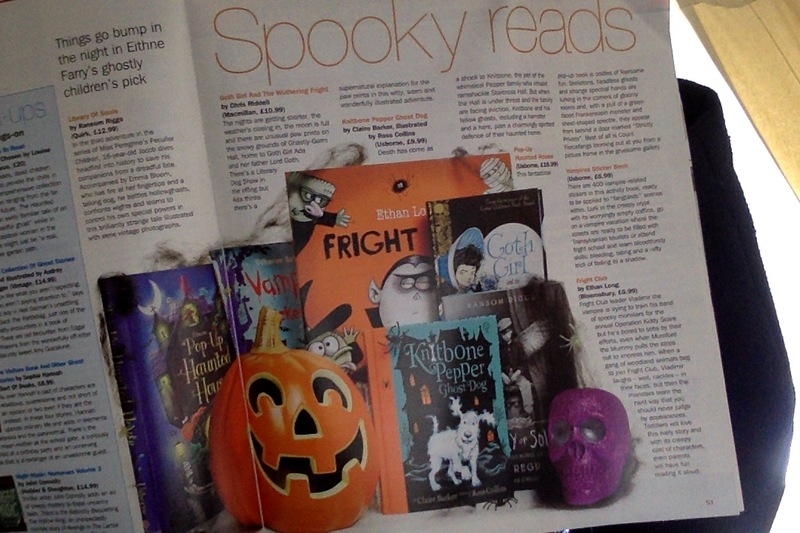 Here’s my article about haunted houses in children’s fiction from Neil Gaiman to JK Rowling. Follow this link to read all about it. WOW! What a wonderful week in London that was! 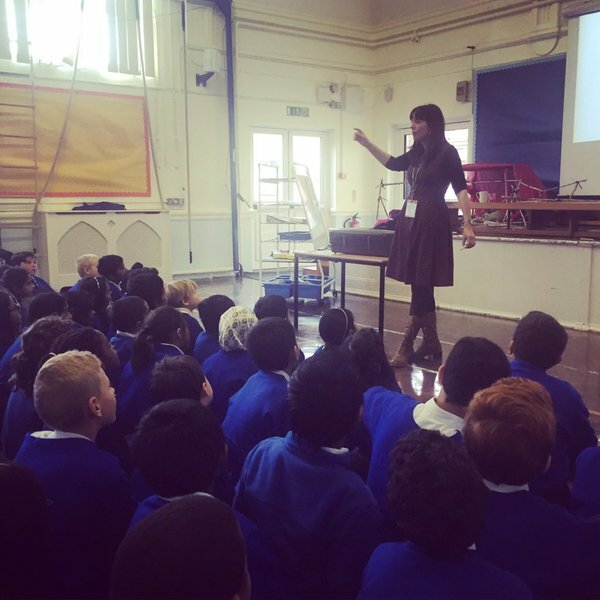 Firstly I went to visit the children of Chatsworth Primary school in Hounslow. The first thing I noticed was that they had a bus as a school library – YES A BUS! 🚌 Everyone was so friendly and welcoming and one little girl even gave me one of her stories to take home. (Reham – I read your story and I think it’s very good. I like the bit where Trixie’s face turns violet. That’s a very good piece of descriptive writing, especially for a 7 year old.) 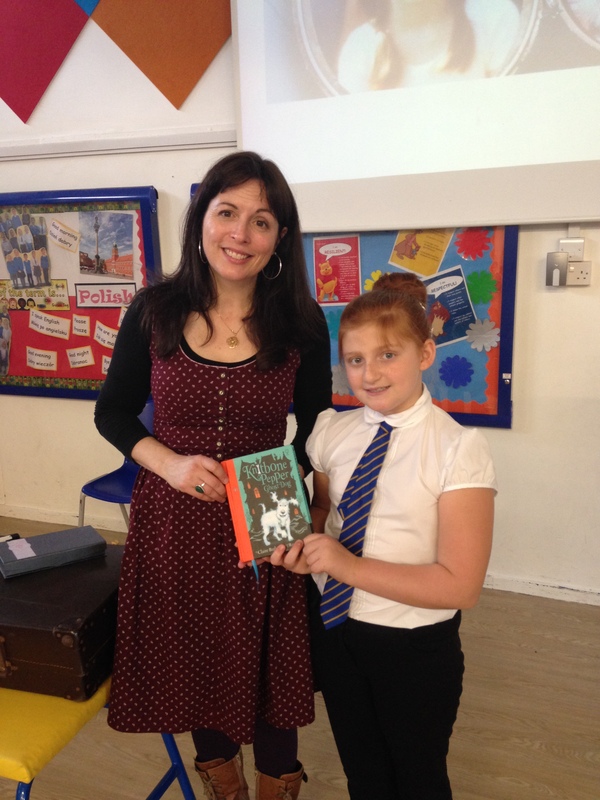 Then we went on to Orlean’s school in Twickenham where I was asked SO many interesting questions and signed lots and lots of books.Then, the next day I visited a terrific school with a very special young lady. 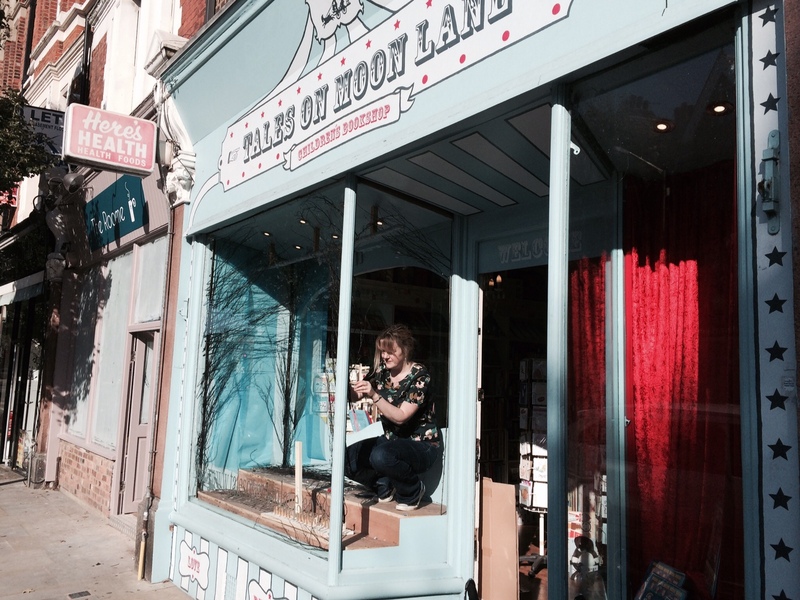 In the afternoon I visited Tales On Moon Lane; a beautiful children’s bookshop in Herne Hill in London. They have a wonderful window FULL of Knitbone Pepper, stars and a big moon, not to mention Starcross Hall. It looks really magical. 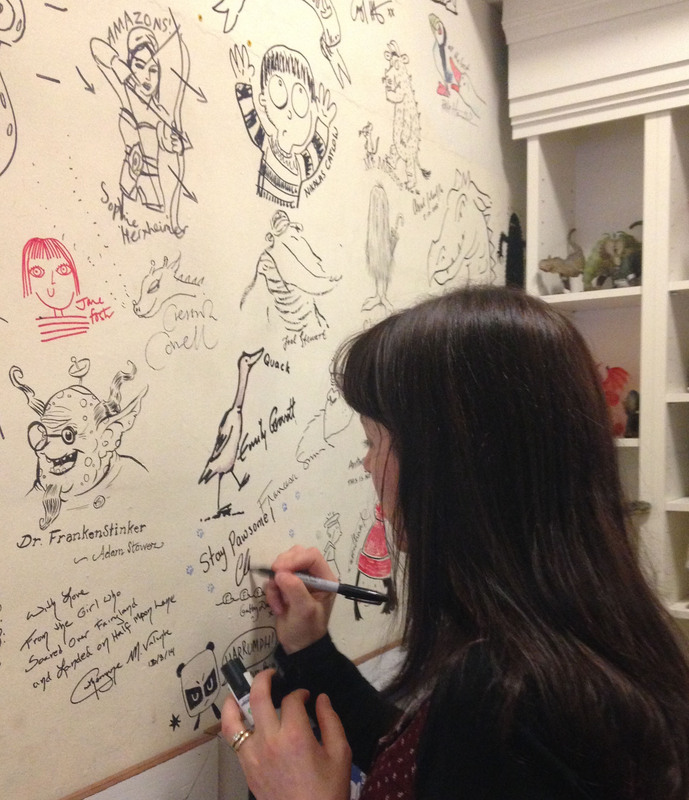 Whilst I was there I signed lots of books and even got to write my name on their author’s wall. I felt very lucky because I could see Mog by Jan Pienkowsky, and signatures from Chris Riddell, Francesca Simon and so many more. Most thrilling! 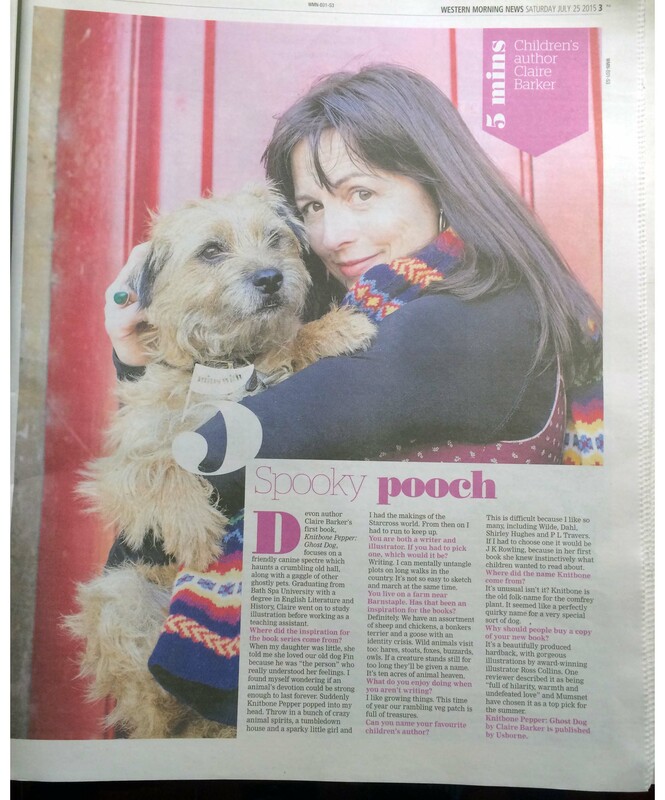 Sunday 25th October 2015 – Knitbone Pepper is a top pick in The Sunday Express today! SPOOKTACULAR! 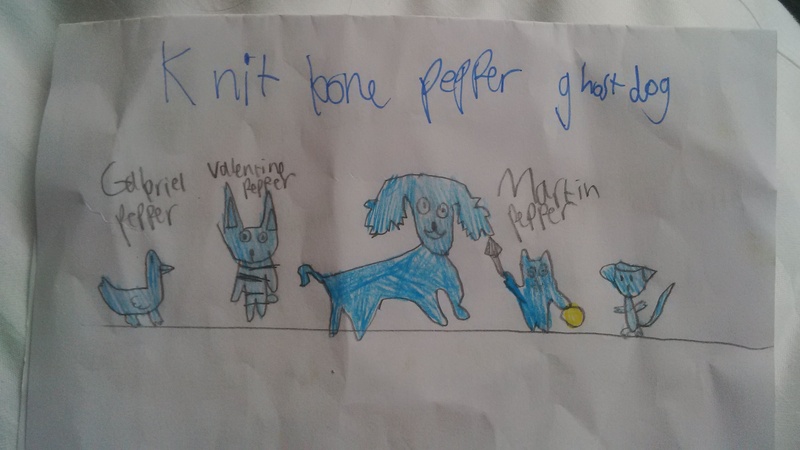 Check out FunKids radio here and ⭐️WIN⭐️a copy of Knitbone Pepper Ghost Dog! I’ll be here, with my suitcase, talking about my bonkers animals and Knitbone Pepper. The event is FREE so come along and say hello. Books will be available for sale after the event and I will happily dedicate them and stamp them with my special paw print stamp. Here I am signing books. I love all the painted faces! I’m in Plymouth! Today I visited Boringdon Primary school and St Peter’s where I signed lots of books and answered lots of interesting questions (hello Abbi, the answer to your emailed question is ‘reading lots of stories!’) I hope all of you that took home a copy of Knitbone will have fun reading it. Tomorrow morning I’m on BBC radio Devon with Fitz at 11:30 then atI’m at Stoke Damerel school. On Saturday I’m at Plymouth Library for an hour at 11:30. At lunchtime we spotted this chap doing an excellent impersonation of Knitbone. Thank you to Charlie and his owner who let us take a picture. He really is adorable. 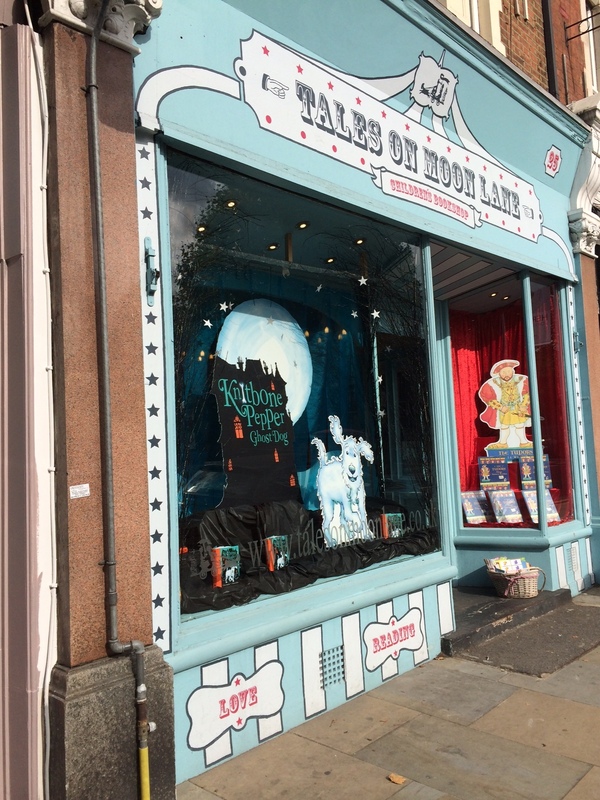 Look at this beautiful window at Tales On Moon Lane in Herne Hill in London. I am so happy I could burst – even the little orange windows will glow at night! I’ll be here signing stock on the 23rd of October at about 2pm. Do come and say hello if you’re around! Thank you Grace of High Down School. It was a lovely surprise. 🐶 MESSAGE FOR LILY TANNER: Dear Lily with the red hair who I met on a train to Devon: Thank you for your messages. 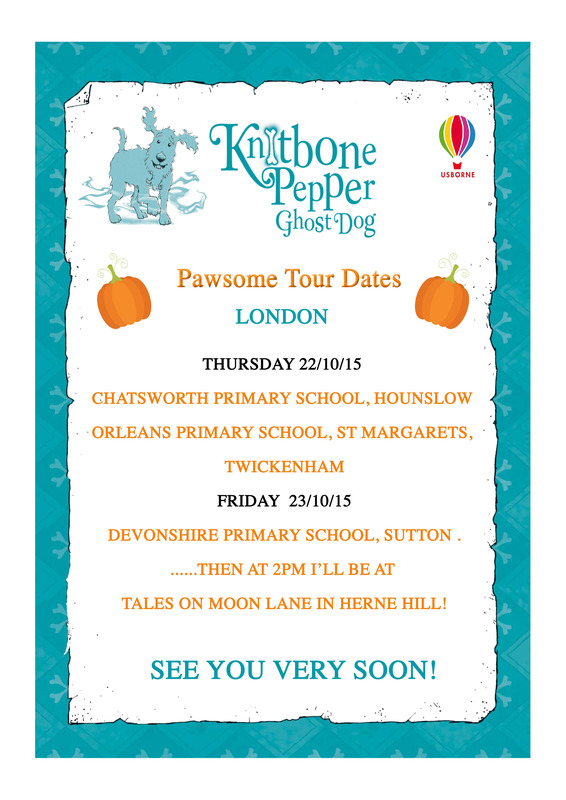 I AM COMING TO YOUR SCHOOL ON FRIDAY THE 23RD OF OCTOBER JUST BEFORE HALLOWEEN!! 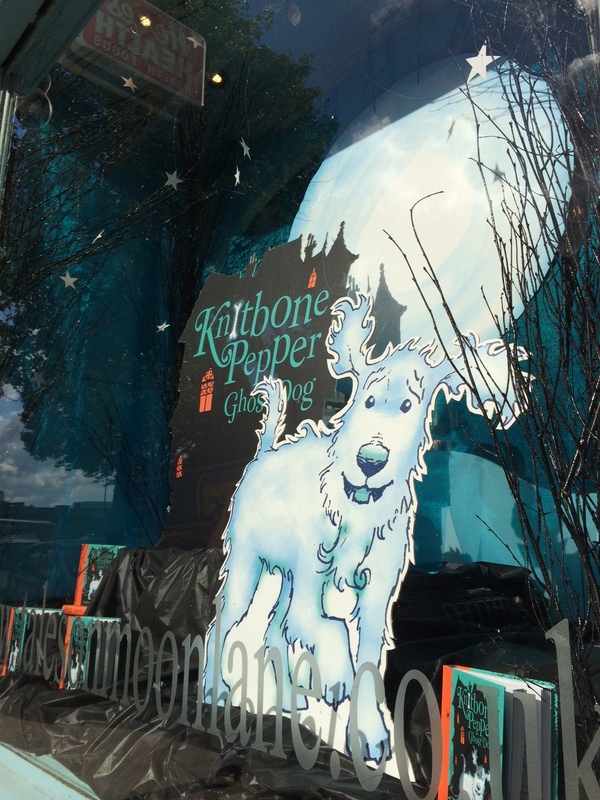 You can get a copy of Knitbone Pepper at your local Waterstones in Sutton. I’ve sent messages to your mum’s inbox 😃 SEE YOU SOON! Wednesday 21st September 2015 I visited West Croft Primary School in Bideford. Everybody was dressed up in fancy dress! There were pirates, princesses, superheroes and Harry Potters not to mention lots more. I had such a wonderful time hearing about everyone’s pets and some of the questions were very clever. Thank you for having me! Saturday 19th September 2015 10:30am – 12 noon I will be at lovely Walter Henry’s bookshop in Bideford with my special paw print stamp, signing books and giving away free postcards. Come along and say hello! 16/9/15 What a wonderful party that was, so magical. I shall remember it forever. More pictures in a while……. Today! Today! 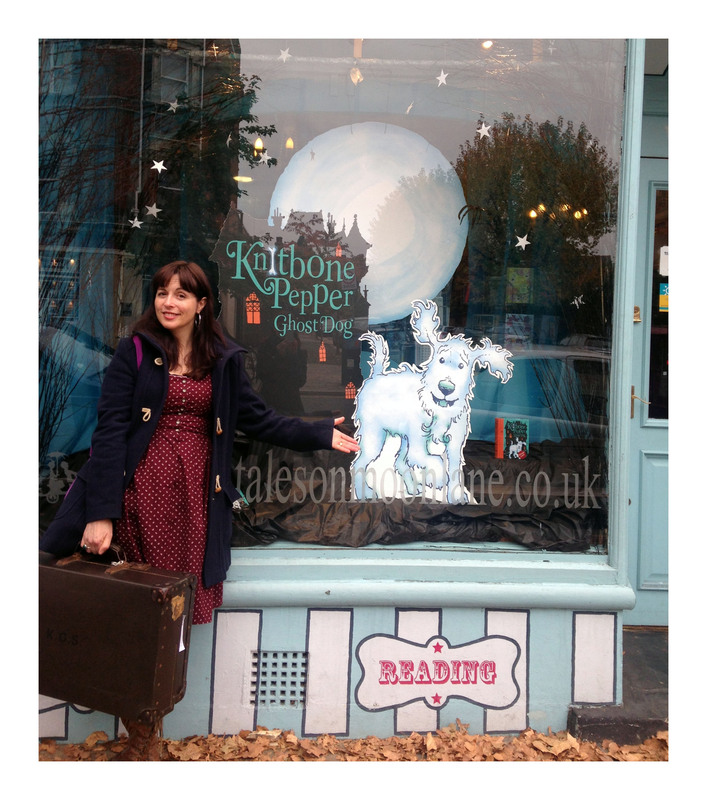 TODAY is my (yes I know I’m a bit late) launch party for Knitbone Pepper. It’s in a big white gallery by the sea in Appledore, with flutes, fiddles,guitar, biscuits, fizz, fairy lights and ginger beer. There’s even complimentary dog biscuits for special friends at home. I. AM. EXCITED. Here I am with Harri, Ruby and Nipper. Thanks everybody for coming along. I had such a fun time! 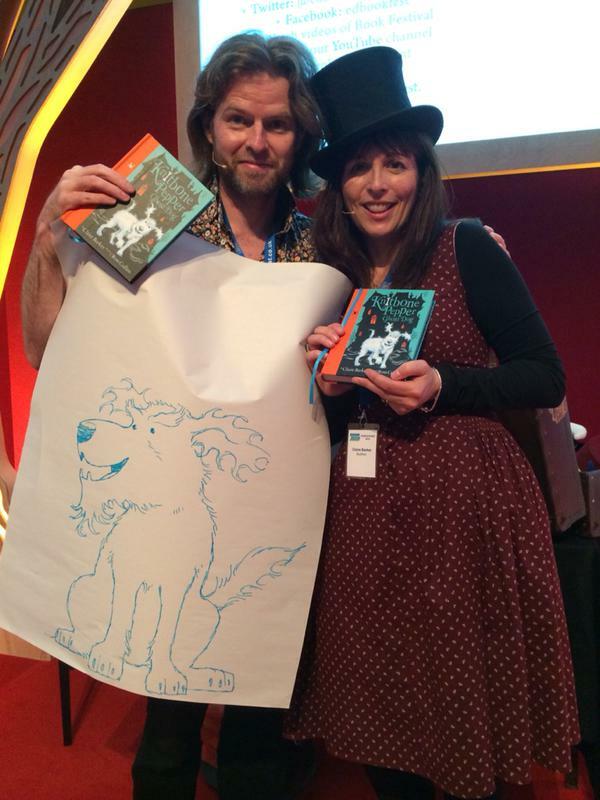 What a wonderful time Ross and I had at the Edinburgh Book Festival! THIS WEEK IS EDINBURGH WEEK! I’m packing my suitcase and I can’t wait to see you on the 27th! ‘Discover the power of biscuits! 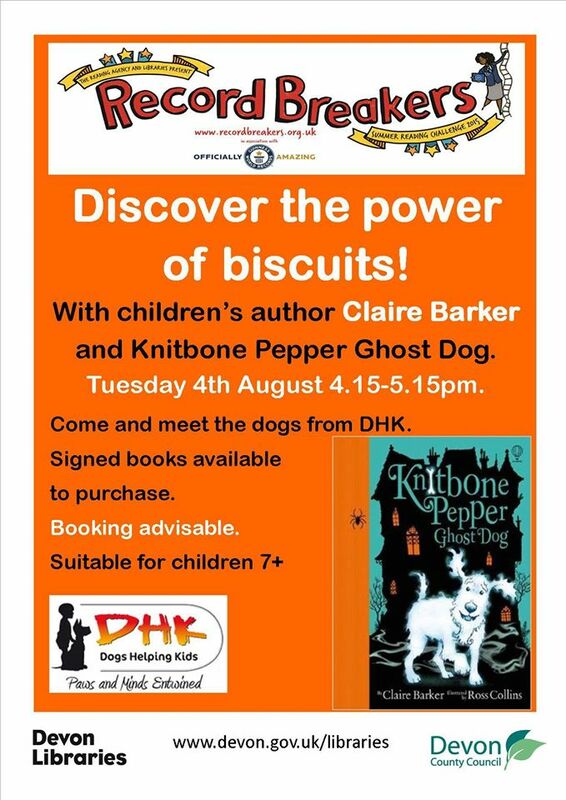 with children’s author Claire Barker and Knitbone Pepper Ghost Dog. The dogs from Dogs Helping Kids will be here too. 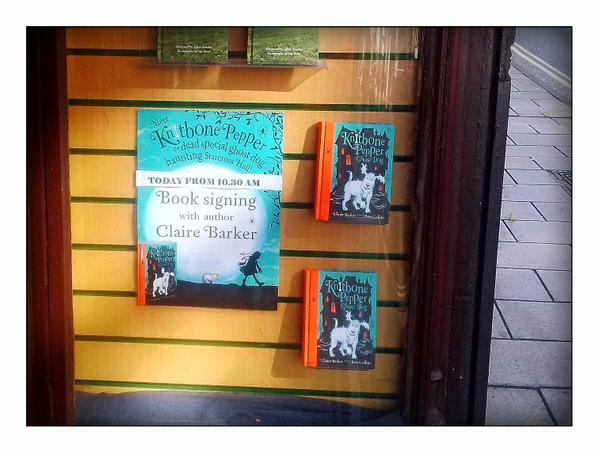 Claire will be signing copies of her books which you can buy on the day’. Saturday 24th of July – The Western Morning News! 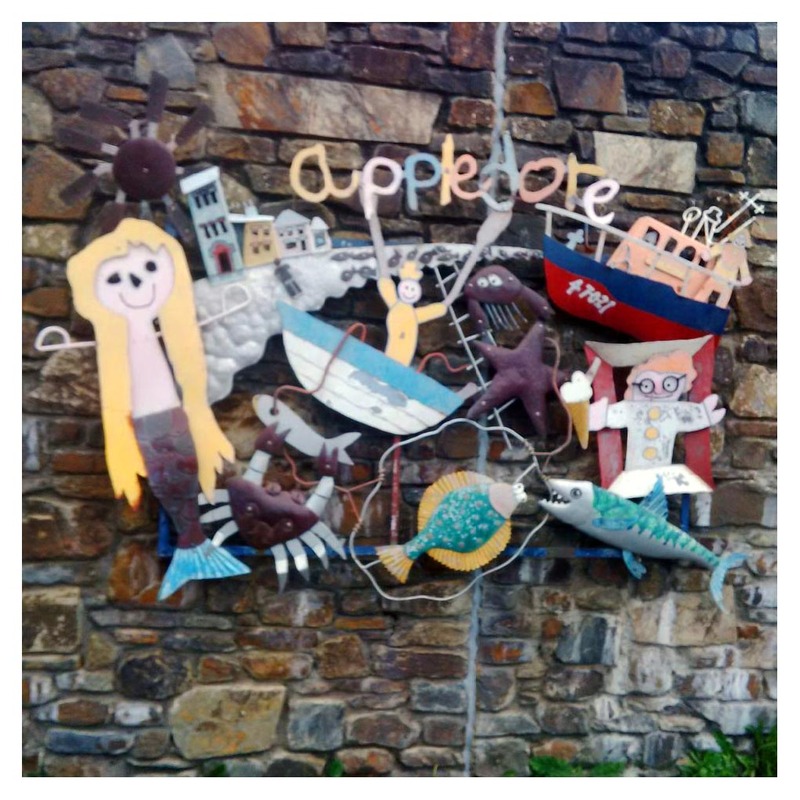 I AM VISITING SCHOOLS AS PART OF THE APPLEDORE BOOK FESTIVAL CHILDREN’S PROGRAMME! Wed 16th and Thurs 17th of September. WE ARE AT THE EDINBURGH BOOK FESTIVAL ON THE 27th AUGUST! 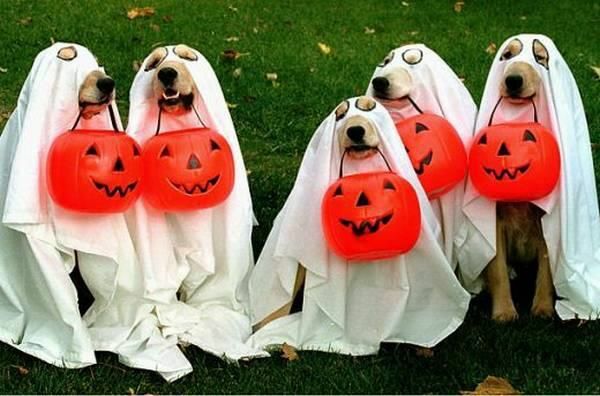 Come and hear about ghosts, ghouls and things that go bark in the night. Knitbone Pepper is a friendly ghost dog who haunts the crumbling Starcross Hall with a gaggle of other ghostly pets. When he discovers that the Hall is up for sale and his beloved owner must leave her home, he takes things into his own paws. Find out all about this fun and quirky new series with author Claire Barker and illustrator Ross Collins.